The 1.9 release continues the balance between construction and survival play. I have plans, thanks to NullWire, for some good changes. I had hoped to include more in this release but my injury is stopping from doing much right now. Watch this space. MrShortee invented this work of art. 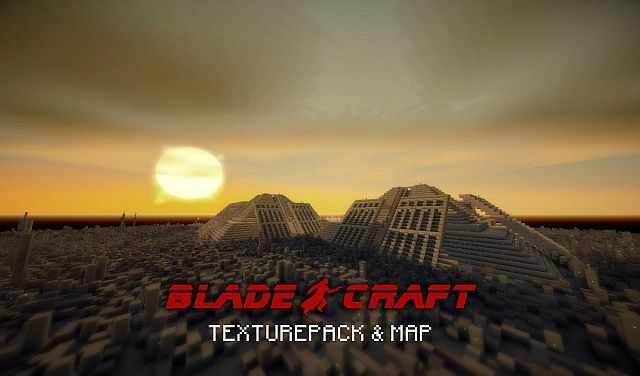 He has graciously granted me permission to update the pack from the Minecraft v1.5 original. MrShortee made an absolutely amazing Blader Runner World to explore with the pack. You should definitely donload it!!!! As you know, this pack is beautifully detailed. I finally have horses that fit with the pack and I made armour that goes with the theme. I turned out well. Blade Runner was the first movie I ever owned. I have watched it more that 100 times (not kidding). I have spent a great deal of time learning MrShortees style and carefully crafting the extensions to the pack. MrShortee paid me the ultimate compliment when he had difficulty telling the extensions from the originals. I will continue to pay special attention and endeavour to make all the coming additions as seamless as I can.